We all know that Epiphone makes budget-friendly guitars that are suitable for both beginner and intermediate guitar players. Epiphone made a name for themselves because they always give good value in exchange for your money, and we all respect that. The DR-100 is Epiphone’s best selling guitar, and there is a reason for that. The DR-100 has a lot of features which can be found on guitars that cost double or triple the price of this particular model. The body of this guitar is made of mahogany, and it has a spruce top, which basically means that its a high-quality guitar that won’t let you down in the middle of the road. What’s unique about this guitar is that it has a mahogany neck which uses the SlimTaper profile, which is a feature that can be commonly found on Gibson & Epiphone Acoustic Guitars. A SlimTaper neck will let you have a better grip on the neck of the guitar, and you will be able to move up and down the fretboard easily. 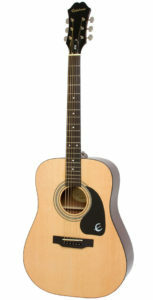 To get something similar to this on other guitar brands, you would have to pay at least twice the price of this guitar. I’ve played a lot of different acoustic guitars in my life, but as soon as I got the Epiphone DR-100 into my hands, I noticed that the sound of it something I’ve never heard before. Every time I play it, I wonder how is it possible for such a cheap guitar to make that sound. considering the price, it is better than it should be. The sound that comes out of the guitar is pretty clear and loud, and that’s all you need if you’re a beginner guitar player. Of course, it has some disadvantages, such as the low-end response, but that won’t be a huge problem when you’re just starting out. I don’t think that this guitar would be a good option for professional guitar players, because professionals usually have their own style developed and the DR-100 won’t be suitable for them, because it can’t handle all playing styles. 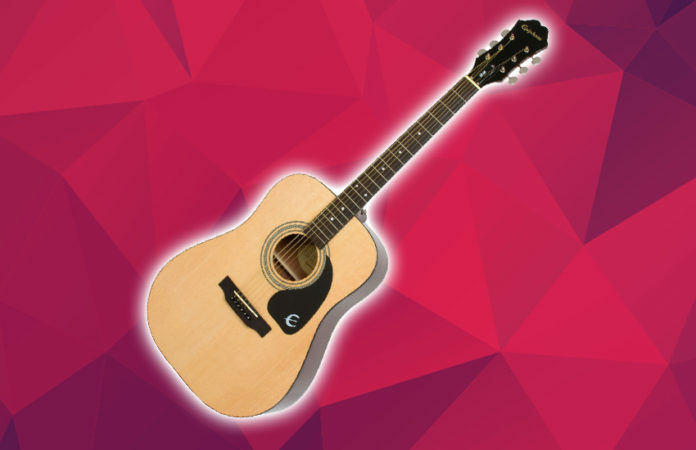 However, it’s hard to beat the Epiphone DR-100 when it comes to acoustic guitars for beginners. It’s good enough to learn the basics and also learn some guitar chords, but I wouldn’t go further with it. If I was invited to play in a gig, I wouldn’t take the Epiphone DR-100 with me, because it won’t sound that good. Of course, it wasn’t built for that reason, but it’s a thing to consider. 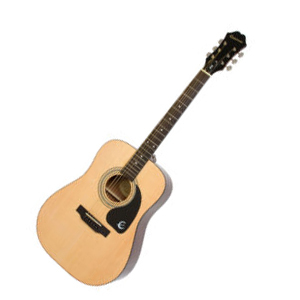 To conclude, I would only suggest this acoustic guitar to beginner guitar players that want to improve their skills. After you are confident that you are skilled enough, you can look for acoustic guitars in the higher categories.